All transactions are safe and secure with a reliable history in online purchasing behind each of our associates. Buy the Huxtable Names t-shirt to own Cosby Show clothing and merchandise. Many fans dream of being a part of the Huxtable family and most have a favorite character who they like to watch? Who is yours? Do you like comedian father Cliff or comforting disciplinarian Clair? Perhaps you prefer their successful eldest Sondra, trying son Theo, lesson learner Vanessa or feisty little Rudy? It is hard to choose because they are all very different, so we aren't going to make you. 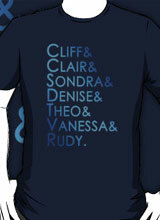 This Cosby tee highlights all the members of this family friendly eighties TV show. In addition to the Huxtable Names tee above, browse the Cosby Show Clothing Gallery for more apparel like men's and women's clothes, kids shirts or hoodies.